Humans naturally love challenges. When we do not have problems to solve, we get bored and frustrated. Part of the fun of team sports, apart from the social benefits, is the problem solving that takes place as you try to beat the other team. When we are alone, we might play computer games such as World of Warcraft (pictured), or even something as simple as Patience (with cards). Even something as seemingly mundane as gardening involves strategy … when and what to plant, prune, fertilise, or tend in some other way. Your work (or school) can be more enjoyable if it involves creating strategies to solve problems. Mathematics and thinking are no different. We are presented with a hands-on or abstract problems and try to work out ingenious ways to solve them, or prove that they are impossible to solve. The study of mathematics is a lifelong quest to think better. To think more clearly and more smartly. A lot of this involves playing games and solving puzzles. That is exactly what you will find here! Richard Hovasse's bridge and torch problem (also known as The Midnight Train and Dangerous crossing) is a logic puzzle that deals with four people, a bridge and a torch. 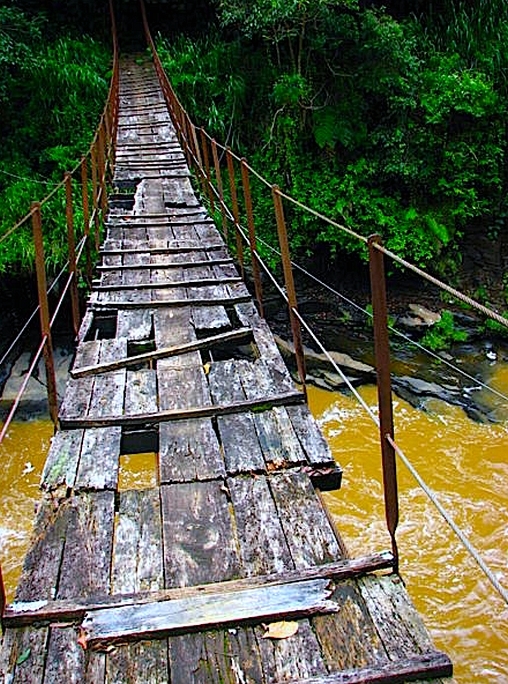 Ahmed, Bindi, Cassandra and Donavan have to cross a dangerous bridge in the mountains late one night. They have only one weak torch to share and because of the weak light and nature of the bridge, only two of them can cross at any time. Now, they must cross with the torch and, when two people cross, they must travel at the pace of the slower person. 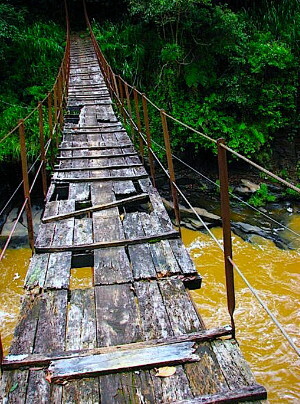 They have discovered that the bridge has been rigged with explosives and will be deomolished in exactly 18 minutes. It is vital that they cross within that time frame! 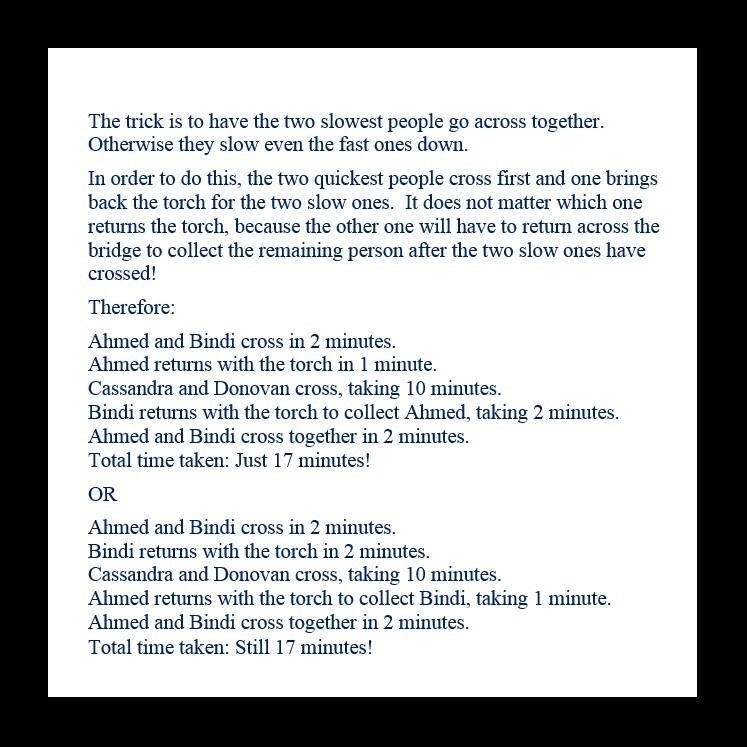 Finally, Ahmed can cross the bridge in one minute; Bindi can cross in two minutes; Cassandra will take five minutes; and Donovan (who is injured) will take ten minutes. 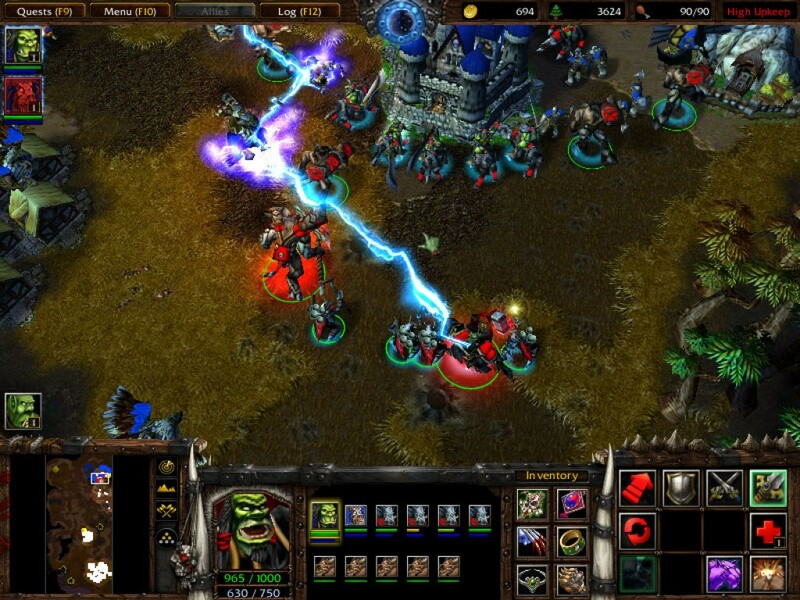 Your challenge is to work out a strategy to get all four people across the bridge in less than 18 minutes. There is no trick to this. You don't have to think of flying, climbing, swimming, crossing three at a time, or anything like that. Treat this as the 'standard' puzzle that it is. I really can be done!